ERROR : ... android-support-v4.jar doesn't exist . 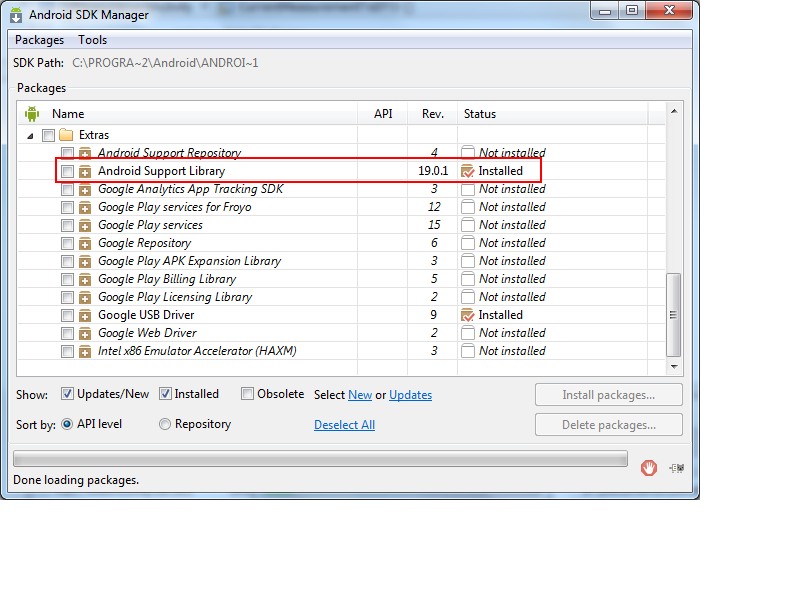 also i already downloaded 'Android Support Library' in to Android sdk manager!!! Verify the Android SDK location in the Project options? Confirm you have revision 19.0.1 of the Android Support Library within the Android SDK manager launched from Tools>Open Android SDK Manager? 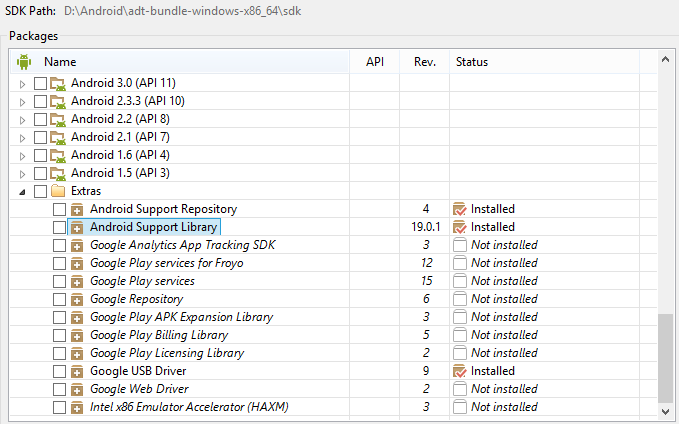 I have android support library with revision 19 but sdk manager has't any downloadable library for 19.0.1 revision. 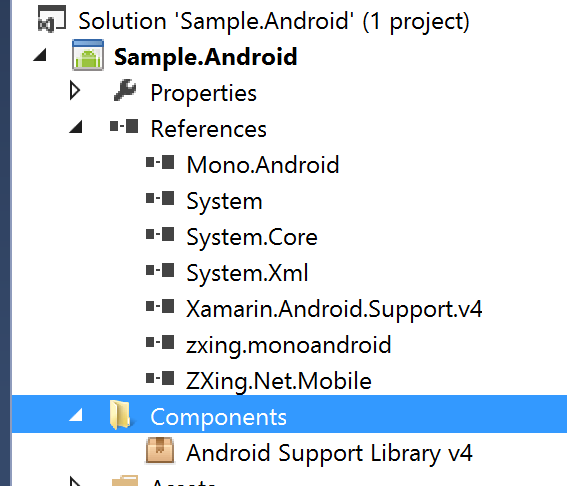 You must also add a reference to the Component Android Support Library v4 https://components.xamarin.com/view/xamandroidsupportv4-18 from the Component Store. Did you add this component? If so make sure the reference was added in correctly, you might have to remove the component and re-add it. Also make sure that the folder name isn't too long either as on Windows you can run into a long folder name issue. I attach screen shot from my Android sdk manager and project references. The problem was't solved,please help me! Don't know if the problem for you is the same that we had few weeks ago, but if the path is too long it won't be able to load the jar file. Moving project to root directory solved it. Thanks Steva,I moved the sample to C:\ but problem still exist. @s.mahdihossaini after you moved it to C:\ can you delete the Components folder and then re-open the solution? This will re-download and extract the components. The support libraries no longer require you to have them downloaded via the Android SDK manager as we include them in the component so the versions always match. Thanks JamesMontemagno,i will test it. Where do I put this library?? Is there any other way to solve this problem???? I have the same issue, did you solve the problem? No, the problem still exist. what is your mono android version?? anyone got solution to this issue. 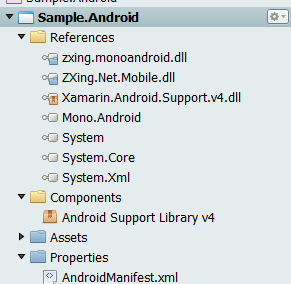 my xamarin.android version is 4.8 is this an issue???? I have the same problem in Xamarin.Android 4.8, any solution to it? I also got same problem. Is anyone already got the solution?